you are a quick draw Harley. MOl - we think Harley won this one! Daisy, I think Harley got you there. Can't believe Harley came up with that one! Ha ha ha! Good one Harley! You finely got Daisy. Too cute. 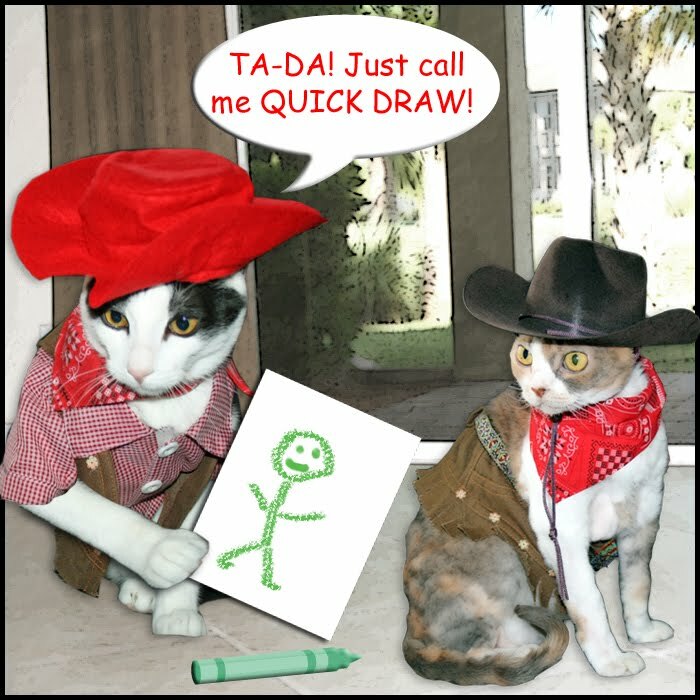 Harley you are certainly a quick draw artist but we has to say Daisy looks dashing in the stetson. I think he has you there Daisy. I think you should switch hats. The Stetson is more manly than that red one Harley has. I think the red one would look cuter on you, Daisy! 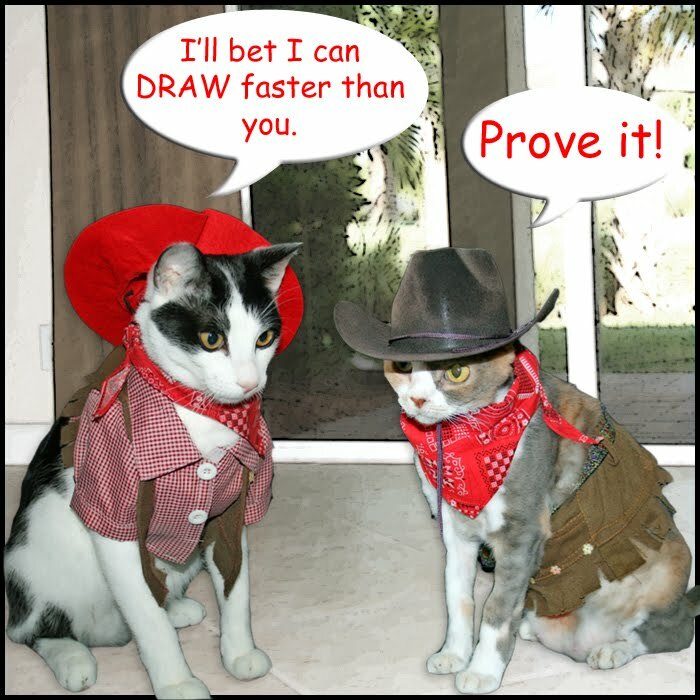 You both look terrific as cowboys. Good job modeling Harley and you were the fastest draw. Good job Harley. Oh Harley!! That's so funny!! MOL!! Too cute! 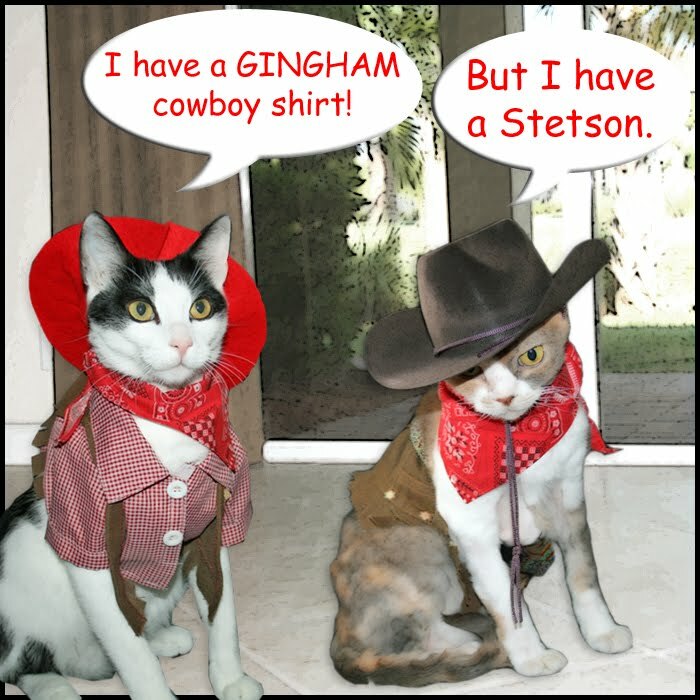 We think you both make great cowboys! Daisy, I think Harley got you on that one! I think it is a "draw"--Harley is the best cowBOY and Daisy is the best cowGIRL. Is that fair? That was a pretty quick draw!! Harley, you are definitely the quickest draw! fastest crayon in the west. We do have to say you are quick on the "draw" Harley. Oh Daisy...you put it over on your brother!!! I can't believe Harley fell for that! You certainly are quick on the draw Harley, and you are the best cowboy. Daisy is the best cowgirl. Harley, yoo made us larf owt loud! Nice job Harley. You are the best cowboy. Daisy is all hat and no cattle. Harley is very quick on the dram, but can you lasso better than he can Daisy? A HA HA HA HA...Quick Draw McGraw! BERAVO~!!! *sigh* Daisy, putting up with those younger ones is quite exasperating. Daisy, what you have to put up with! A smarty pants younger brother! I think the stetson wins! Daisy, where's your horse? Giddy up! You guys always make me laugh. Harley got ya this time Daisy! Darn that Harley -- he's a tricky one, Daisy!! That's a great drawing, Harley :) I think you and Daisy both make good Cowboys!! Harley is the best cowboy, and Daisy is the best cowgirl! Big difference. We like both of your outfits. We thinks you are both great cowboy kitties! That is awesome drawing Harley!! And Daisy's cowboy look is really perfect! You sure showed her, Harley! both of you look fabulous. harley! i didn't know you were a cowboy and an artist!!! Harley is so silly... I think he tricked you, Daisy! 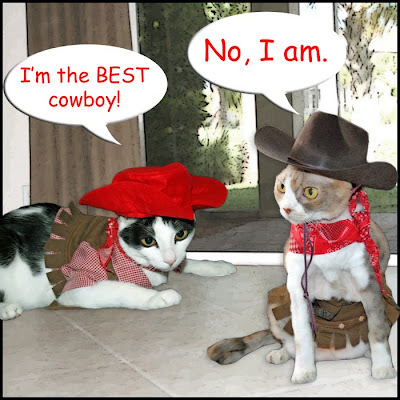 I think you are BOTH awesome cowboys (and cowgirl too!). I wonder if Daisy will ask for a re-match? I'm sure she could draw REALLY quick! Wow, Harley won for sure that time! Oh no!!! It looks like Harley got the draw on you this time Daisy!!!! Hehehehehehehe!!! HA! You both look like you belong in Texas... can I bring you to Dallas with me?